Click on any request in the left pane and you will see its properties in the right pane. The module automatically integrates with the product and enables it to display AMF messages. Since such messages contain hierarchic data structures, they can be represented either by tree-like objects (similar to a tree of disk folders) or XML documents. WAPT provides both representations. You can select a tree node and see an XML document representing its content. 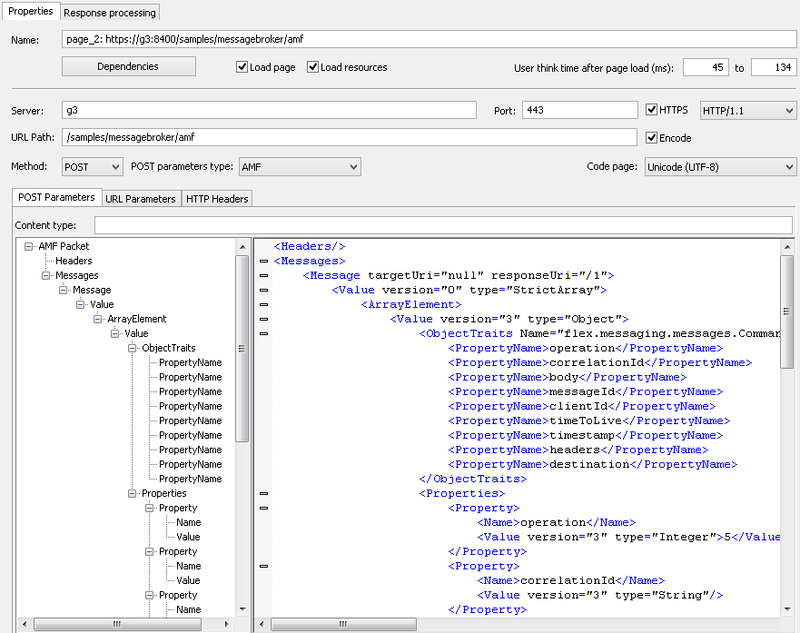 You can edit the value of any tree leaf and the whole XML document for any tree node. It is also possible to use WAPT internal variables to insert session-dependent values here. As a result when the profile is executed, the values of these variables will be passed inside the corresponding AMF message. Note that you cannot use WAPT functions in the XML code directly. You should define a variable which is calculated as a result of the necessary function, and then insert that variable in the XML code. Responses to AMF requests also contain AMF messages. The processing of such responses is based on the same principle as the processing of a regular HTML page. You may need to extract some data contained inside the message to a variable in order to use that variable in the subsequent requests. This is done with help of the standard XPath function. In the simplest case this function returns the value of a node inside an XML document using the path to that node. On this program view you can analyze the recorded request and server response that was received during the recording process. If the Module for Adobe® Flash® Testing is installed on your system, you will see AMF messages in recorded requests and server responses. Request Header: Here you can see the header of parsed request. 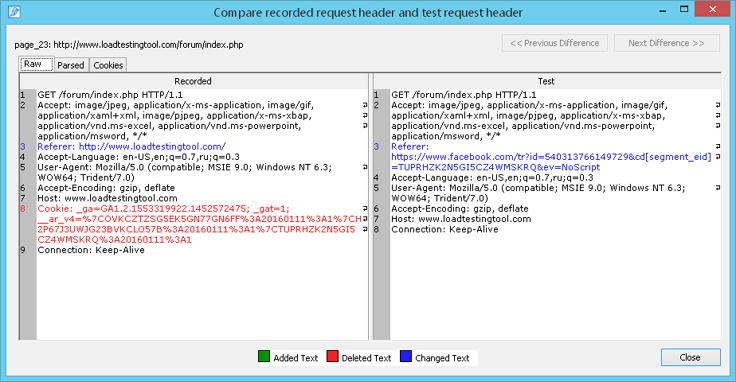 Request Body: The body of parsed AMF request is shown on this tab. Response Header: Here you can see the header of server response. Note. In the unregistered version of the Module for Adobe® Flash® Testing the maximum number of virtual users for tests containing AMF requests is limited to 20. This limitation is removed when you register the product. You can use logs to browse the results of execution of a profile containing AMF messages. 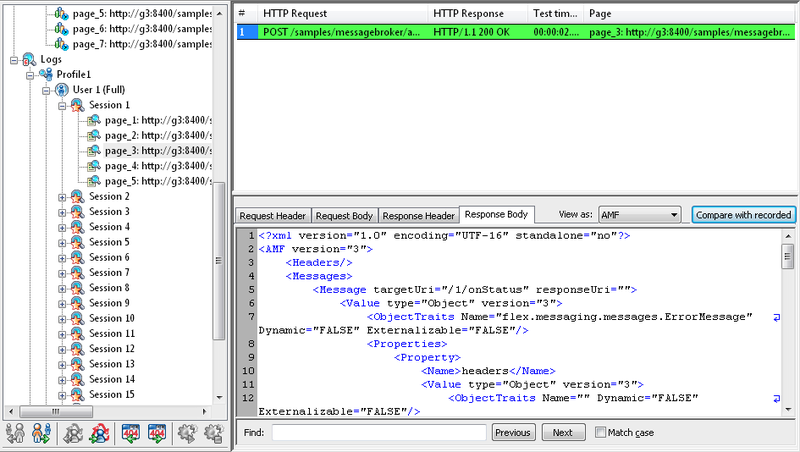 Both the request and server response are shown as XML documents. A special difference viewer will let you easily compare the content of the current message with the originally recorded one. It also appears when you record AMF requests if the Flash-module is not installed.